I tried to set a link from a page to a section of the frontpage. I looked into the source-code to find the ID to build a link like https://mydomain.com/#anchor. I tried it then with https://the-cats-pyjamas.ch/#contact-754494, but this opened the frontpage (on top, not at the section “contact”). Hope someone can help me with that, I’d love to add these anchors to the menu too. I just want to confirm, are you trying to change the anchor links on the page? 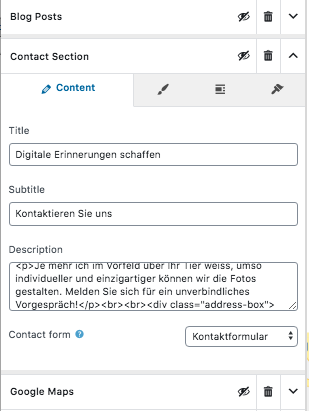 Change… where can I set them for “Contact Section” and “Blog Posts”? These seem to be the ONLY two sections where I cannot set a Section ID. That’s why I asked if I can find the section ID somewhere in the source code. I mean… of all things that someone would want to link to (from a menu, within a post) are the contact sheet and the newest posts. Pretty weird, that these are the only sections I cannot do that and I‘m not putting up a second contact sheet. 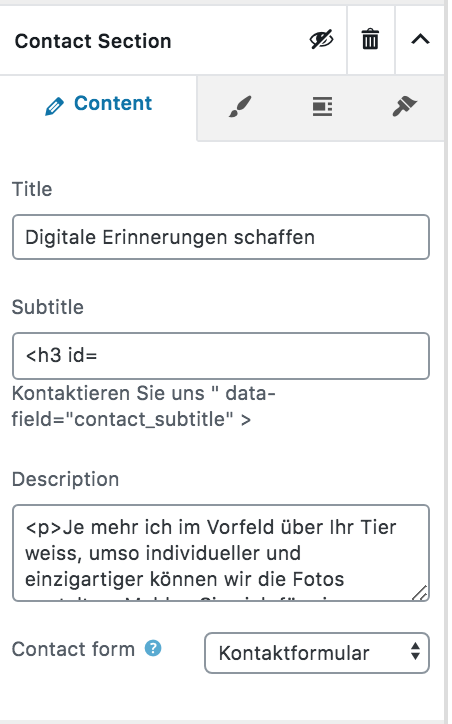 But I am confident, that the enhancement of adding a field into the customizer for a section id to contact and blog too is being realized. Thanks again to Mihaela who was very helpful with all my questions! never mind… there ARE no section ID’s in the customizer for “Blog Posts” and “Contact” (see printscreens attached). That’s why a Github issue has been opened (https://github.com/MachoThemes/portum/issues/222) for an enhancement of the customizer of Potrum. The topic ‘Looking for anchors of sections on Frontpage’ is closed to new replies.